We have heard the message. We are rethinking both the website and how we make data available to Canadians. Early next year, StatCan will begin the beta testing of new prototypes, and will invite users to test drive them online and tell us what they think. “The goal of the project is to make our information more readily accessible to a wide range of data users. So we really wanted to think about the ways that our statistics—especially our aggregate statistics—are organized, stored and presented on the website, and how to make it simpler for people to navigate through our data holdings,” says Bill Joyce, the Director responsible for the project. Developing this new dissemination model is a three-year project. In year one, large-scale, national consultations were conducted to find out what users need and want and a vision was created. Now, in year two, those ideas are implemented and tested. The new model builds upon important open data changes made in 2012, including the move to make data free on the website and the adoption of an unrestricted licensing agreement that removes barriers to re-using data. Dynamically driven content fed from a common database: A new database of aggregate statistics will feed more dynamic content on the StatCan website. Old style data publications filled with page after page of data tables will be replaced with a more modern and interactive way of presenting data. Better navigation: An enhanced web structure will improve navigation, and will focus it on users’ main areas of concern. Applying consistent filters will make it easier to find information. The current 32-subject categories will be fine-tuned and an A–Z list will make it easier to find specific topics. Users will also more easily find data by geographic region. Simplify the product line: A simplified, standard product line will make the site more functional and easier for users to access. The goal is to achieve a common format. No matter what subject, the interface will be familiar and understandable. Revised output formats: One template will be used to display all data—from simple indicators and tables that can be displayed and printed, to complex tables that can be customized and manipulated by users. More sophisticated users will be able to download full datasets using Web data services. How can users help? Well, there is no time like the present. Please use the comment feature on this blog to tell us what you think is important. Tell us why the website needs to be improved. What are your pet peeves? What works? What should change? We will be conducting usability testing with users for the remainder of this year. Please stay tuned for our online beta testing in 2014. This is great news, and using a blog to give users a preview of upcoming changes is very appreciated. But in general, I find the Stat Can website fairly good considering how much info you have, and the wide variety of users. I have noticed many good improvements over the last few years. But it sounds like the changes will make an even bigger difference. Kudos for listening to your users. I'd love to see your tables labelled more appropriately. On this page: http://www.statcan.gc.ca/daily-quotidien/130619/dq130619e-eng.htm?HPA the links/labels are "CANSIM table051-0005", "CANSIM table051-0006", and so on. Why not label them by their title? Why do we have to click to find out what information is inside them? Thank you for your suggestion, joshloewen. We are in the process of revamping our dissemination model and your suggestion will be considered as we develop new ways to better serve our data users. 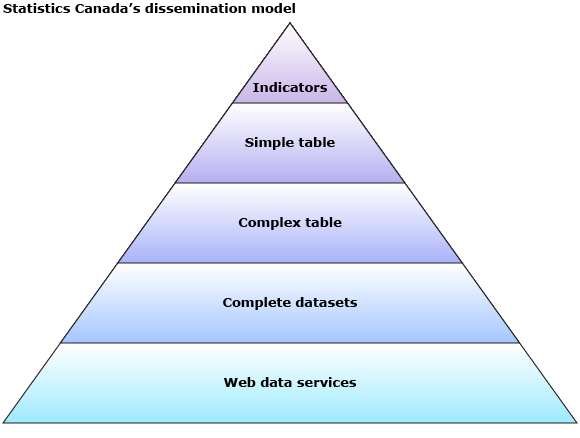 What data base system are you planning on using for your publications? ABS is using the OCED .stat product. Statistics Canada is planning to develop a new system in-house. It will include a repository to house all of Statistics Canada’s standard aggregate datasets. These datasets will be available for download and via web data services (APIs), but they will also feed interactive data tables on the StatCan website. Please stay tuned for a sneak peek of our new prototypes which will be available as beta tools on our website in the spring of 2014.